What an incredible event with an amazing group of women. This year's Nourishing Spirit, Mind, Body Conference was filled will insights, laughter and great connections. 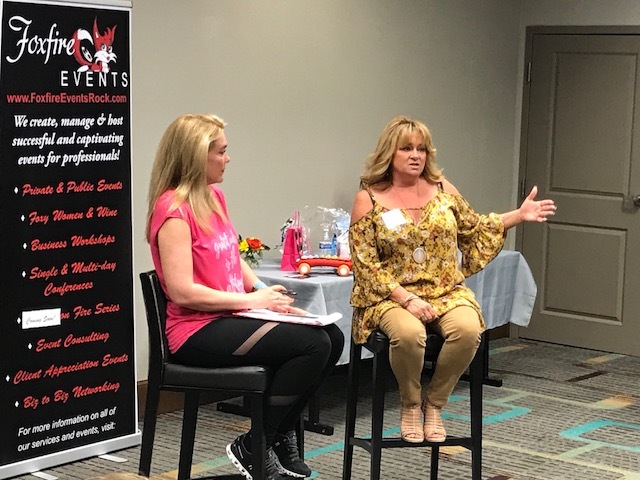 Lynn M. Bunch spoke to the group about Intuition – what is it? Who has it? And what can we do with it? She talked about the importance of learning to quiet the mind chatter to steer clear of pain, struggle and fear. We have become so mental in our everyday lives that we are not living from an instinctual place that allows spirit to guide our mind and manifest our desires through our physical being. She facilitated an open discussion about developing each of our personal connections to spirit and what that can look like. For some of us, we feel our guidance, for others we know without proof or evidence, others may see or dream intuitive messages and still others may hear their intuition through music or the tone of a voice. Which of these each of us utilizes first is part of the curriculum at Intuitive Development that ultimately becomes part of your unique Blueprint – the roadmap of you. This group of engaging women dove right in with deep questions. The group as a whole was curious and animated throughout the discussion. They asked specific, pointed questions and jumped at the opportunity to interact with Lynn on the spot. Lynn’s accuracy and humor won the group over quickly from the start and many from the group were able to gain valuable insight into challenges they are currently facing and take home tangible ‘next steps’ to keep their lives moving forward with ease. Thank you Foxfire Events for hosting such an empowering conference!